Created in Dubai in 2008, SAWA CONSULTING is a consulting firm specialised in support for operations in crisis zones. Our mission is to support humanitarian and private organisations in the conceptualisation, preparation and management of their missions in high-risk environments. Thanks to a wide network and our local roots that really help us stand out from the crowd, we can offer access, analysis and risk management solutions. The firm is powered by a pool of experts from university, humanitarian and security environments, with a great deal of experience in the field. 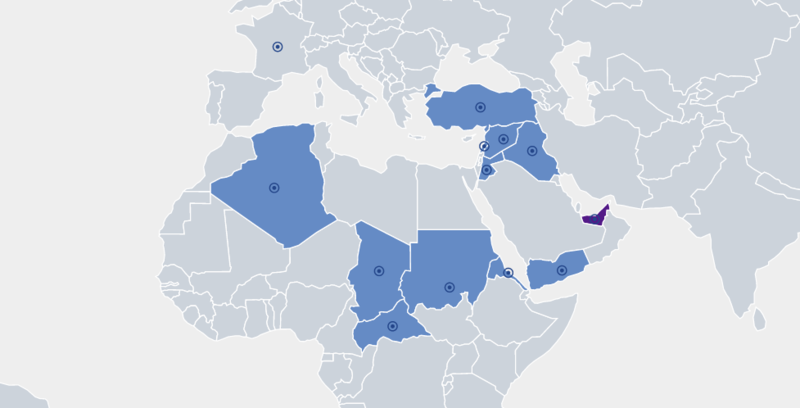 This resource means we are backed by a network of local partners, which makes it easier for us to understand the geopolitical context and how to access it. We pride ourselves on our responsiveness: SAWA CONSULTING is truly field-oriented. We can intervene for clients on tight deadlines, and in any crisis environment. SAWA CONSULTING is a part of the Recherches Humanitaires-Ressources Humanitaires (Humanitarian Research – Humanitarian Resources) (RH2) Association. The association’s objective is two-fold: to help researchers gain access to the field and enable NGOs to better manage their environments. This networking has helped improve the thought process behind humanitarian action and scientific knowledge of local contexts. Since 2008, SAWA CONSULTING has carried out dozens of missions in high-risk countries, and conflict or limited-access zones, in the Near and Middle East, in Sahel and Central Africa (Syria, Iraq, Yemen, Jordan, Turkey, Lebanon, Algeria, Central African Republic, Chad, Eritrea and Sudan). The firm has been commissioned by humanitarian organisations and cross-sectorial companies (archaeological heritage, business, raw materials, etc.). SAWA CONSULTING adapts to individual client needs and can answer specific requests. For information on our services, please contact our team! one-off missions. If you have international relations expertise and field-based skills, please send your CV. Sawa Consulting - All right reserved. Web-developper : Céline ANNIBAL.